Children in Indonesia can experience vastly different realities. Imagine a Jakarta boy named Budi (left on top of the infographic), born today in the Bantar Gebang slum. With a healthy start in life, he could reach age 5 in 2020 and be a successful high school student by 2030. Grace (on the right), a young girl from rural Papua would be turning 13 today and coming of age with a high school diploma in 2020. She could head a green technology start-up by 2030 on her way to becoming one of the leaders of her country. This can be the future of a growing number of children in a prosperous 2030 high-income Indonesia. This reality can endow Indonesia with its future teachers, entrepreneurs, doctors, social workers, engineers, CEOs, and religious leaders. Their futures could also look radically different. Both born to poor parents, they actually may have low chances of evading poverty – like many of their friends. Today, 14 million Indonesian children live under the national poverty line of around 10,000 IDR per day and some 48 million live with less than 20,000 IDR per day limiting their opportunities of becoming healthy, educated, happy and successful citizens. Budi faces a 1 in 25 chance of dying before age 5, and a 1 in 3 chance of becoming stunted which will affect his brain capacity, future skills and earning prospects. Grace has a 1 in 6 change of being married before age 18 to then drop out of school and become a child bride and mother. Both children’s exposure to poverty, malnutrition, poor health, low quality education, and violence have costs to their bodies, brains, and to Indonesia’s economy now, and in the future. These costs are staggering. An estimated 2-3% of the East Asia and Pacific region's GDP is lost every year to violence against children and 1.7% of GDP to child marriage in Indonesia, according to the latest research by UNICEF and academic experts. In a context of increasing inequalities, all these drivers also increase the risks of disenfranchisement and social detachment that could threaten the stability of the Indonesian society. But these numbers can be turned around. It is proven that placing children front and center is a smart investment in a country’s economic growth which yields high rates of return. Research from the Copenhagen Consensus Think Tank, for instance, has shown that increasing the number of children with access to early education produces a Return on Investment (RoI) of $33 for every dollar spent. The University of Padjadjaran, together with Alive and Thrive and UNICEF Indonesia, have determined that good breastfeeding practices in Indonesia would save 5377 children from dying, US$256 million (IDR 3 trillion) in health care costs and over US$1.3 billion in wages (IDR 17 trillion) each year by preventing childhood illnesses and improving cognitive ability and earnings in later life. 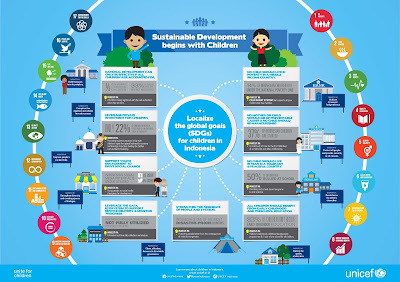 The Government of Indonesia has forged a new pathway to prosperity by integrating the Sustainable Development Goals (SDGs) in the National Medium-Term Strategic Plan 2015-2019 (RPJMN). This Plan invokes the new international goals for the people and the planet - that all countries have pledged to achieve by 2030. The Government is now working to draft a new Presidential Decree outlining steps to 'localise' these promises, including critical indicators for measuring success. Opportunities to implement such a Decree with real budgetary allocations exist, for example through the village funds, managed by the Ministry of Villages, Underdeveloped Regions and Transmigration. Platforms to engage representatives of civil society, academia and the private sector are being put in place to monitor accountability and progress to achieve the SDGs. Children must be at the heart of these bold reforms. It is important that age and gender disaggregated data is routinely collected on each of the SDG indicators, for example. Children's views must be solicited in reporting against targets through participatory mechanisms. And no indicator can be forgotten. At least 50 of the SDG indicators directly impact on children and they must be reflected in national and local planning in their entirety. The global targets of the SDGs are zero-based targets. They require governments and partners to take action that doesn't only reduce, but eliminate childhood violence, harmful traditional practices such as child marriage and stunting. There must be no poverty, no child out of school and no family without clean water or quality health services. When the world takes stock of progress towards the SDGs in 2030, Indonesia’s advances will be significant. With the growth of its population and its economy, Indonesia’s progress will also move the needle regionally and globally. 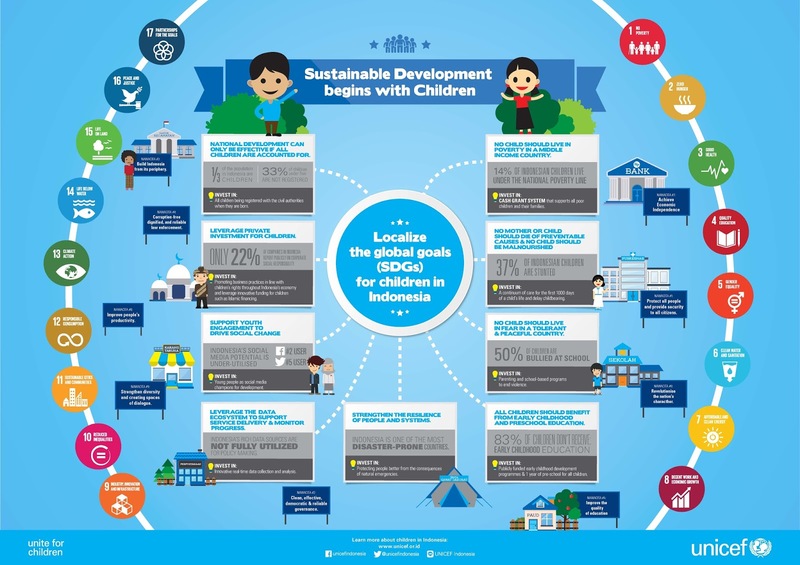 Equipped with an ambitious roadmap for children, Indonesia’s footprint will matter even more for global progress towards the international goals. It could position Indonesia as the global powerhouse for change China was for the Millennium Development Goals (MDGs). Budi, Grace and millions of children depend on it.